Money in politics, is there a way to deal with it between extremes? I just finished my summer program at Carter Center few days ago, where I was working as research assistant on how to improve democracy in Latin America. In particular I studied the relation between media, money and political campaign according to the electoral laws in eleven countries. Perfection doesn’t exist unfortunately in the mix of these elements to help create real democratic regimes, but we all understand that “Equal time rule”, “Network neutrality” and “Fairness doctrine” (recently eliminated in the US) are important tools to guarantee the so called “par condicio” (in Latin words “equal treatment”) in the use of media during campaign. At the same time the relation between money and politics is a delicate issue given that both public and private funds are potential improvements and potential limits to democratic systems. 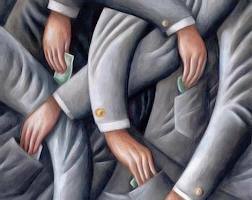 Public financing and party subsides (that should aim to equality and pluralism) tend to create corruption (as the disastrous Italian example shows) while private funds (that should aim to meritocracy and popular support) tend to create extremely powerful lobbies and so the problem of unbalanced lobbying (like in America) and the corruption of the crony capitalism (all around the world). The point is that democracy is always struggling to find the right equilibrium between these two possibilities of financing its politics. Both the Italian and American examples demonstrate how more often democracies chose the extreme solutions that are not very much beneficial to the functioning of their systems. Italy for example now is choosing to eliminate the public funds after having them dominating the public policy through corrupted parties since the born of the Italian Republic (as a too angry and embittered population cannot accept any more the idea of public support to politicians). While in the US public funds can be received only if the candidate refuse the private ones (the last two Presidents opted for the private funding as it was much more than the public) and this system gives money too much power in influencing politics of the government (often blocked because of lobby power) with the risk of creating the “tyranny of the wealthy” instead of the “tyranny of the majority”. Actually, as an interesting recent study by Princeton University Prof Martin Gilens and Northwestern University Prof Benjamin I Page argues (1) in the US economic elites and interest groups representing business have an enormous influence in policy, respect to average citizens and mass-based interest groups. This is not exactly healthy for a democracy, being in reality more comparable to an oligarchy. But there are countries that have in their laws norms that require a strict and limited use of funding in politics, and from these best practices we can learn to improve our democracies around the world, like in the case of Italy and the US. The problem is that as usual laws are not sufficient to guarantee a real democratic functioning of the party system (otherwise Latin American countries like Brazil, Colombia or Mexico, that have very good electoral laws would have uncontested political campaign and level of democracies higher than what in reality have). Constitutions and electoral laws can help to control the power of money in politics, however we need strong political, judicial and social systems in order to guarantee that laws are applied and used in a proper manner. Besides this the issue of the role of money in politics has an equal opposite and broader question that is related to it: the one of the role of government in the economy of a country. As a matter of fact if the money doesn’t have to influence too much politics than politics has to regulate money or otherwise it will become sooner or later conditioned by it. But in our capitalist democracies the role of government in the regulation of money is not very much accepted (and actually created the level of inequality and the power of the banks that we have today). A couple of interesting recent books (A commercial republic, O’Connor, Capital in the twenty-first century, Piketty, and Seventeen Contradictions and the End of Capitalism, Harvey (2)) show how today capitalism is at a crossroads with this dilemma: how much a democracy needs to control the inequality created by capital for its own survival? Again as Italian poet Manzoni said: “Ai posteri l’ardua sentenza” (posterity will judge) but in the meantime we need creative, constructive and concrete solutions to cure our sick capitalist democracies before is too late. Previous PostAfter Gaza: A Changed Status QuoNext PostFrom big to small countries: “make democracy work better” in a globalized world?